This manual gate valve is used on most propane forges and on our Victory Forge propane double burner forge. Made from forged brass with a 1/4" pipe thread and a female pipe on both sides. Has a 4" handle. 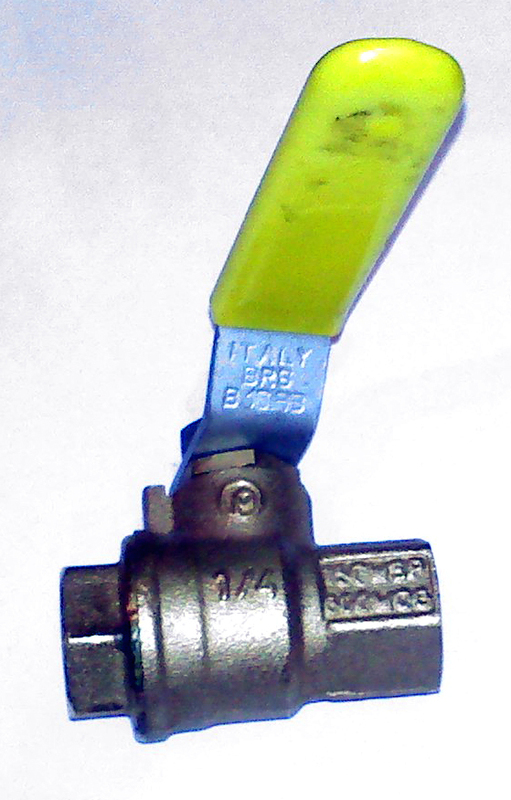 A ball valve opens by turning a handle attached to a ball inside the valve. The ball has a hole, or port, through the middle so that when the port is in line with both ends of the valve, flow will occur. When the valve is closed, the hole is perpendicular to the ends of the valve, and flow is blocked. The handle position indicates the hole, or port’s, alignment. Ball valves are durable and usually achieve perfect shutoff, even after years of use. They are therefore an excellent choice for shutoff applications and preferred to globe valves and gate valves for this purpose. They do not offer the fine control that may be necessary in throttling applications but are still sometimes used for this purpose.